2. HOT BATH Hot shower is relaxing to the body, but it reduces sperm count as the temperature of the testicles are raised. 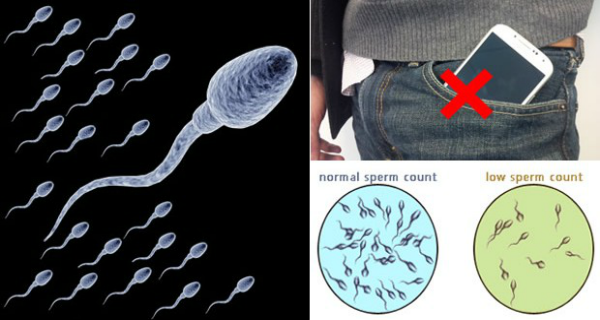 This damages the sperm quality and reduces the count. 3. CELL PHONES (RADIATION/HEAT) The radiation that comes from the mobile phones have a great impact on the sperm count of men. Studies show that heat or electromagnetic radiation that emanates from mobile phones can reduce sperm motility by 8.1% and viability by 9.1%. Avoid keeping your phone in your pocket for long periods. 5. STRESS This is no surprise. Out of a hundred harmful effects to the body, lowering sperm count is one thing that stress is capable of causing. A high level of stress hormones in the blood can lower sperm count, affect sperm production and also affect the sperm quality. 6. SUNSCREEN Chemicals present in sunscreen lotion can harm a man’s sperm count so one should be alert while using a sunscreen lotion. Chemicals found in sunscreen can reduce sperm count by 33%: Octinoxate alters hormone levels, and oxybenzone slows sperm production. Limit time spent in the sun and wash off sunscreen immediately after coming indoors. 7. INCLUDING TOO MUCH SOY IN YOUR DIET An excellent source of proteins for vegetarians, soy is known to mimic estrogen in the body. It is believed to increase the production of the female hormone in the body, thereby reducing the male hormone. A 2008 Harvard School of Public Health study revealed that even half a serving of soy a day was enough to harm a man’s sperm production. Better cut down on that soy milk and tofu. 8. TIGHT BRIEFS Tight Briefs Wearing tight briefs can increase the heat in the testicles. This in turn lowers the sperm count. Prefer boxers over tight underwear. 9. LACK OF EXERCISE AND BEING OVERWEIGHT A higher BMI increases the risk of development of many diseases in the body, including infertility. Obesity also increases the level of estrogen in the body, which directly affects the production of sperm. Extra layers of fat also raise the temperature of the body, especially the groin area, which again heats up the testicles.